Little Nunu and Chloe are a bit weary of their homeland right now, with the never ending aftershocks since the big earthquake that hit Japan, exactly one year today. Not to mention, the memory of getting stuck in one location for hours and hours and hours wasn't exactly one of their fondest travelling experience. Still, it had its thrilling and reflective instances. I got a quick reminder of how fleeting life's moments can be. It should be treasured on a daily basis because in an instant, it could be over. 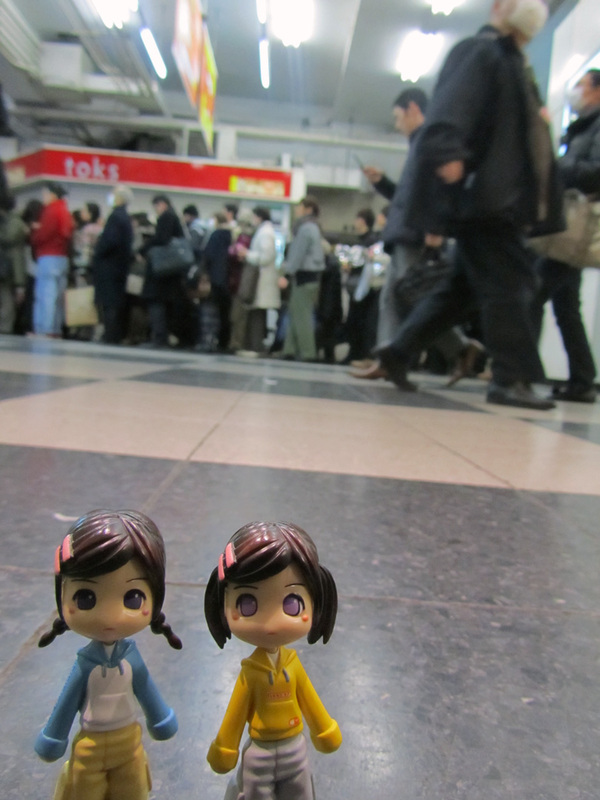 And so, my little travel dolls and I are thankful to be safe from harm. We wish the best for those who were affected by the devastation in Japan and pray that the lost eventually find their way home. We remember. Hello from Spain: I also feel the earthquake in Japan. It was a great catastrophe. In your previous post two dolls I love you took to the road trip to visit your parents. The clothes they wear is beautiful. I like sunglasses. When I travel I also usually wear one of my favorite dolls. In the destination floor always buy some dolls. Keep in touch.